This paper relates the growth in men’s prison admission rates to increasing economic inequality through the 1980s and 1990s. Previous research on incarceration examined national or state-level data, but this analysis constructs detailed annual prison admission rates for age-education-race subgroups. 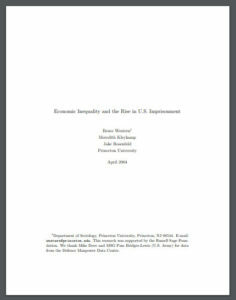 Analysis indicates a significant increase in educational inequality in incarceration; nearly all the growth in the risk of imprisonment between 1983 and 1999 was confined to noncollege men. Regressions of admission rates on men’s labor market outcomes indicates the negative effects of wages and employment on black men’s incarceration, and the negative effects hourly wages for white men. If 1980s wage and employment levels persisted through the late 1990s, estimate suggest that prison admission rates would be be 15 to 20 percent lower for men at all levels of education. Two major social trends reduced the living standards of young loweducation American men over the last thirty years. The earnings of men with just a high school education were eroded by the tide of rising U.S. income inequality. While wages fell, growth in the American penal system turned prison and jail time into common life events for low-skill and minority men. The new inequality and the prison boom both date from the mid-1970s, and both trends continued through the end of 1990s. 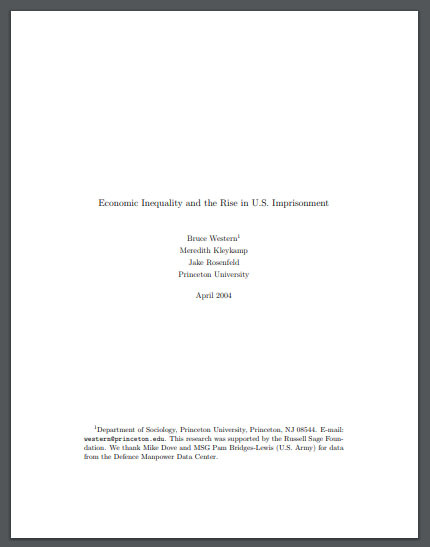 Has the growth in economcic inequality contributed to the growth in American imprisonment? Incarceration might be connected to economic inequality in two main ways. Rising inequality may increase crime at the bottom of the social hierarchy, generating more arrests, convictions, and prison admissions. Thus Richard Freeman (1996) argued that young black men turned to crime in response declining job opportunities through the 1980s and 1990s. Troy Duster (1997), similarly claims that the collapse of legitimate employment in poor urban neighborhoods drew young black men into the illegal drug trade, steeply increasing their risks of arrest and incarceration. For sociologists of punishment, criminal law functions not just to control crime, but also to contain marginal populations that are perceived as threatening by elites and voters.